Getting a little R & R! 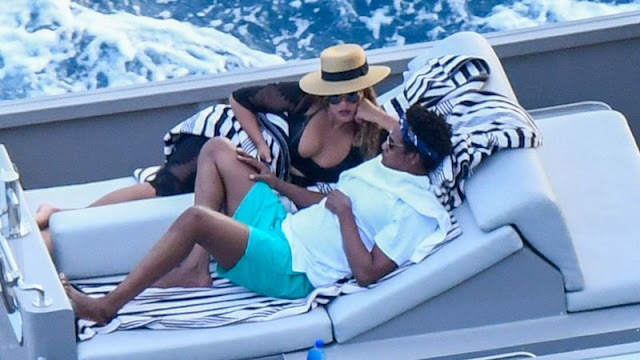 Beyonce and JAY-Z may be in the middle of their gigantic On the Run II tour but that doesn’t they mean they can’t find time to get some well-earned rest together. The world-famous duo was recently spotted looking comfy as they lounged aboard a yacht off of Italy’s Amalfi Coast. The songstress wore a black bikini under a sheer black dress for the day of relaxation. She completed the look with a tan sunhat and round sunglasses. JAY sat nearby rocking aqua-blue swim trunks and white T-shirt while taking in the world-class view. He also sported shades, as well as a blue bandana on his head, for the scenic getaway. "Out in Nice great food, great music, great people. ❤" Tina wrote, before playfully calling out both Beyonce and her eldest grandson, Julez Smith. "@bono I am being the Mamarazzi and she is not co- operating❤ with my love Julez." Finally, at the end of the clip, Beyonce turns her head and acknowledges her mother recording with a wave of her hands, making for a priceless moment.